Do you have speed boats and motor yachts? No, we have only sailing yachts. Every yacht has an engine which we use for getting in and out of the ports/marinas or if there is no wind. All our routes are completely safe. All routes have been already checked for you. As for personal belongings, keep an eye on your items while out. The yacht can be locked and in case of emergency we can contact the local authorities and coast guard. I’ve never been on a yacht. Is sailing for me? Is it OK? 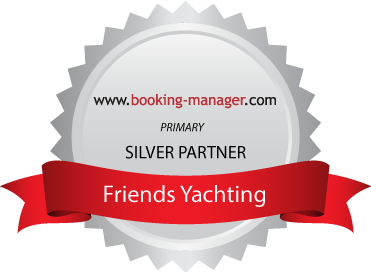 Most people sailing with 'Friends Yachting' did it for the first time. For all of them was the most spectacular holiday in their life. Freedom, accessing remote golfs, exploring different islands and sunbathing in the middle of the sea make your yachting holiday a relaxing experience but still active and full of attractions. Everybody gets easily used to living on a yacht. Your sailing luggage should be similar to the one when you go to the seaside. Beach clothing and some casual outfit for the evenings out. Usually, half the clothes will not be worn, your bathing suit mostly, maybe more than 70% of the time. For beginning of May and end of September it is recommended to have thicker, waterproof clothes. Highly important is the windproof jacket and trousers. Footwear: High heels shoes won't do any good. It is recommended to have easy footwear, casual; sandals and flip-flops are great. Shoes with black bottom might leave marks to the non-skid deck; this is unpleasant and pretty difficult to clean. Test your shoes by rubbing it to the shower cabin or any other plastic surface before taking them aboard. If they leave marks, they're no good. Each boat has a different price? Prices vary according to the moment of booking, age of boat, amenities and destination. All our boats are in excellent condition and none is older than seven years old. Do I need to pay a deposit? What is it for? Yacht deposit varies between 1.500 - 3.000 Eur. and it is necessary to cover all damages and loses generated by crew members. Damages may be small, like: loss of a fender, loss of towels, burned pillow, clogged toilet; big damages include loss of dinghy, burned sail, broken hatch. Deposit will be charged upon arrival in the marina, before boarding. As long as there are no damages, nor loses, full deposit will be returned upon check-out. In case of accident generated from third party fault or exclusively from skipper's fault, deposit is not affected. Where do we sleep? How are the cabins? Yes, you will be sleeping on the yacht. All our yachts have cabins for two. Most of them have king size beds and there is a cabin with bunk beds. There is also sleeping space in the living room. Space is very well divided but still limited. There are two or three bathrooms with toilet, sink and shower. Kitchen is fully equipped. There is an inside table but most likely you'll be serving all meals on deck. Also, each boat has electric power (220 V while docked in marina and 12V on engine), fridge, audio system and gas cooker. Even so, most of the time will be spent on deck and you'll be using the cabins only at night to sleep. Is there any electrical power on board? Yes. When we are docked, the boat is connected to shore and there is 230V power. While sailing power is 12V and similar to a car plug. This can be used for charging phones and of course to keep the fridge working. Our skippers will provide inverters to transform 12V into 230V (only if needed). What is the minimal age to attend? 20 years. Teenagers can attend as long as they come accompanied by an adult. When do you need to pay for the yacht? Upon booking the first installment of 50% will be paid. Full payment for a yacht has to be received at least a month before boarding. Payment can be made in 2 installments but mark the calendar for the payment deadline. Following booking and payment of the first installment, cancellation is no longer possible. Even so, your yacht will be soon available online for others to book. Full refund will given as long as the yacht is booked by someone else. We are a small group for an entire yacht. How can we join? In this case, we shall find other people in the same situation as yours. We'll try to complete the crew for a yacht. We shall put you in contact with the others and the final decision is yours only. Can I rent a yacht but not with the maximum capacity of guests? Yes, but the full payment for the yacht still has to be made. The price includes all costs associated to the yacht and sailing: renting the yacht, skipper, towels and linen, safety equipment, sailing equipment, GPS, audio equipment, dinghy with outboard engine and final cleaning. We encourage you to gather a full crew of friends or people who know each other. Rental price is cheapest in this case. If you book a yacht but cannot fill all cabins, let us know and we shall try to find the rest of the crew for you. How do I book a yacht for a week? Go to Destinations, choose a country, a period and book a yacht. You will book for an entire group and you shall be responsible for the group. You can also book a spot. Bookings can be made online and followed by payment. If you manage to plan ahead, you can take advantage of the special offers and discounts which are open during cold season. Choose when you want to sail and where. We offer destinations in the Mediterranean waters, in Greece, Italy and Spain. Yachts have different sizes, options and equipment. Rental prices vary accordingly. The price/person can range from 390 Eur. – 720. Eur. and this includes the skipper. For better planing we offer an orientation list for additional costs. Are there any health recommendations/limitations? Sailing is not demanding and no physical activity is required. Even so, make sure to be in good health and not to be under special medication while travelling with 'Friends Yachting'. Seasickness doesn't count. When can we check-in on yacht and what happens before? Usually each yacht is ready for check-in around 15:00. This means that only then you can get in, to store your luggage. Before, it is advised to do the necessary shopping for food and drinks from a nearby supermarket. What about the check-out procedure? Is there anything I need to do? Check-out is always Saturday, before 9am, a week distance from Check-in. All luggage needs to be carried out before check-out. Also, trash and left overs. Pile up all used sheets and towels in one of the cabins. For when should I book a flight back home? Every boat has to follow a check-out procedure and has to be in the harbour Friday evening; check-out shall be done Saturday, before 09:00 am. You are free to leave Saturday but if you have an early flight, check-out Friday evening. What is the crew list and when do we need to fill it in? The crew list includes information about the crew (name, surname, emergency phone no.) and must be filled in latest a month before boarding. Do we need to pay for skipper? You must assure the food and non-alcoholic drinks for the skipper, for the entire period. What travel documents are required? Depending on the destination, Passport might be required and travel visa as well. Check with your ministry of foreign affairs if you can travel only with ID. It is recommended to have a medical insurance which should include nautical sports. Yachting is considered by some insurance companies as a sport and might not be covered by standard insurance. How can we communicate while afloat? Can we use our mobile phones? There is GSM coverage in all the destinations. You can easily call your friends home or even send them emails. Also, each boat has a VHF radio to communicate with other boats and it is used in case of emergency; VHF will be used by skippers. WIFI internet connection can be found on land at some restaurants. How can we play our music on yacht? Each boat has it's own audio system; speakers are inside the boat and also on deck. There is a Radio CD-Player similar to the one you have in your car. CDs are the safest. Most players can rad mp3 and have AUX in for your iPod. Bring a lot of good music. How much time do we spend on the boat each day? The islands are relatively close together, so sailing between destinations can be relatively quick. Some days will involve about 2 to 4 hours of sailing, while others could be as long as 6 to 8 hours. Navigation is exceptionally easy since all of the islands are within sight of each other. There is no sailing in open ocean where you can’t see land. Every evening, we stop right in a harbour and anchor the boat for the night. This allows us to go ashore easily. The schedule provides a great balance of cruising through the water while still leaving plenty of time to spend on the beach, at snorkeling spots, at restaurants and bars, shopping and other activities. All of the boats in our group will travel together, allowing for amazing social activities with a large group of really fun people. Which is the average age group? We have a pretty wide market as sailing is attractive for many people. The age range would be 20s to 50s. Even so, each crew has been pretty uniform as most of them were friends. How do I know if I will be seasick? You don't. Don't worry, most of us have seasickness. The difference is that some eat more, some drink, some feel sleepy and the worst, some can't do anything but throw up. We have seasickness pills which your skipper will provide for the first two days and your body will accustom to sailing. Is there a professional photographer taking pictures? During some events, yes. If you don't want your picture to appear on any of our promotional materials, please advise us. You can do so when in marina; tell you skipper and he will take care to communicate further. What about luggage? How much space is available? We recommend using bags which can be easily stored under deck or inside cupboards. Space on a yacht is precious is limited. Do I need to bring towels and linen? Each yacht, no matter the size of it, is equipped with a towel/person. Bed linen is also included. Even so, we encourage you to bring your own towel/s. Another advice is to have a beach towel as we shall anchor in different golf and you can enjoy remote beaches. When do you get assigned your skipper? Skippers will be assigned in due time for each yacht. Several weeks before boarding, yacht booker will be contacted and therefore each crew member. A crew list will be filled with personal details for each crew member.